black chlorophyll voice: Do not want to show your email address? 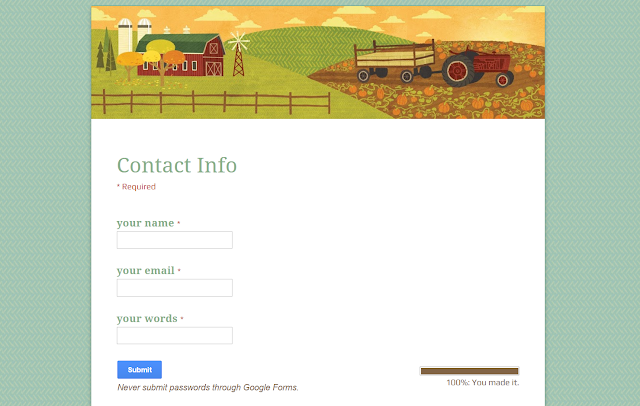 Use google form to make a "contact me" page! Do not want to show your email address? Use google form to make a "contact me" page! Internet is going to make the world more flat, to every black ant. Some times, I need to give somebody my email address, to keep in touch. However, some times, I do not want to give my email address to the strangers-because I hate spam mails to be listed in my inbox. And more, I do not want to share my email address to the strangers-email information is one important part of my online security. Internet means that there always are solutions for internet question-You can use google form to make a "contact me" page to the strangers who you do not want to give your email address. step by step of how to make a "contact me" page with google form. 1, go to website of google form, and open one form. 2, edit your question, and choose "text" in the Question Type!!! 3, you can change the theme for your google form. here is my "contact me" page powered by google form.